Gel pad helps insulate against shock and vibration. Tubular polyester sleeve with a polymer gel disc impregnated in the fabric. Latex free. 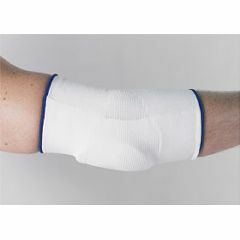 Use on the heel or elbow for comfortable pressure relief. Two sizes are available. Sizes measure flat width and length of the slipover. ARE THERE 2 IN THIS PKG?